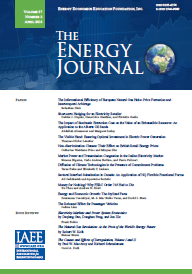 This paper discusses the influence that the world wide liberalization of the natural gas industry is likely to have on the future development of liquefied natural gas (LNG). The paper examines some of the barriers to the workably competitive commodity model for this complex cross-border trade and speculates about the likely future structure of the industry. This paper analyzes the effects of oil price shocks on the characteristics of the business cycle and on welfare in a small open economy, such as in the case of the Spanish economy. The results show the ability of the model to reproduce the business cycle path of the Spanish economy, especially in those periods when shocks in the price of oil were most dramatic. Furthermore, the model reproduces other regularities of the Spanish business cycle. Finally, it is shown that the increases in the relative price oil had a negative and significant effect on welfare. Recent events have led to renewed interest in the petroleum industry. Over the years, the American government has imposed a number of regulatory regimes on this industry. One of the most interesting was the price regulation and product allocation system set in place by the Energy Policy and Conservation Act of 1975 (EPCA) which lasted from 1976 until 1981. To determine the impact of this regime, supply and demand equations are used to derive a reduced form model to test whether the other-things-equal prices of petroleum products were significantly lower or higher during the EPCA period than during the comparatively unregulated 1980s. With some exceptions, the results indicate that the EPCA regulation system either raised prices or had no effect. These results should lead to caution on the part of policy-makers. Even the immediate goal of the policy, lowering prices, did not usually occur. Revenue-raising environmental policy instruments, such as carbon taxes, tend to be politically controversial. In practice, carbon taxes are often differentiated between polluters, implying unequal marginal abatement costs. Grandfathered tradeable permits seem less controversial; this instrument yields equal marginal abatement costs, but does not raise revenue. We compare a system of differentiated carbon taxes, exemplified by the current Norwegian carbon tax regime, to uniform carbon taxation and grandfathered tradeable emission permits. In this particular case, differentiated taxes are welfare superior to grandfathered permits. Nevertheless, uniform carbon taxes outperform both. The petroleum supply process takes place in stages. Decisions at any stage are based on information obtained at the preceding stage. The present paper develops an econometric model incorporating the feedback structure of the process. The model framework consists of a system of simultaneous equations. Using UKCS data the model was estimated, tested for stability and predictive power, and used to conduct a structural analysis, investigating the effects of market conditions on activity levels in a mature hydrocarbon province. The results provide useful insights into the feedback nature of the petroleum supply process and the importance of market conditions to continued activity levels in a mature province.